0:00:52 – Favorite WW2 machine gun to handle or shoot? 0:02:28 – What transferrable MG is the best investment? 0:03:47 – What delayed development of large-caliber heavy MGs like the M2? 0:05:20 – If the NFA registry for machine guns was reopened, would you be happy? 0:15:40 – Is the Browning M2 still made or are the guns all WW2 vintage? 0:16:51 – What MG deserved more attention than it got? 0:20:42 – Opinion on Soviet MGs? 0:23:39 – Why did the Germans have high rates of fire on the MG34 and MG42 and why did the US not do the same? 0:25:58 – What was the most important development in early MGs? 0:30:58 – Why did the US not adopt the MG3? 0:33:14 – How common are rewelded/reactivated machine guns? 0:35:50 – What are good options for the introductory machine gun collector on a budget? 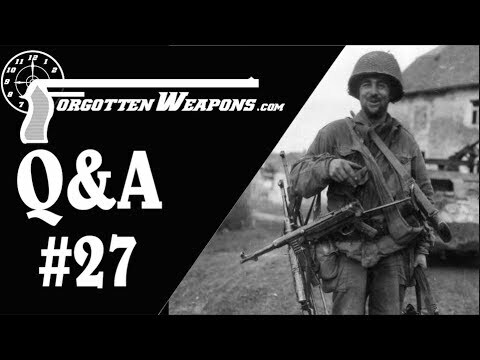 0:42:15 – Why did Germany continue to produce the MG34 after the introduction of the MG42? 0:44:15 – What factors determine machine gun value, and do some obscure guns fall through the cracks? 0:50:27 – What are some examples of transferrable guns the you wouldn’t expect to exist in the registry? 0:52:56 – What are the strangest machine guns that came through Julia and Morphy’s? 0:55:29 – What is the process for moving to a different state with NFA items? 0:56:20 – If you had to pick just one type of MG belt to use. 1:01:15 – How do you know how many guns of a particular type are in the registry? 1:06:20 – Why did the US stick with the M1918A2 BAR as a light machine gun in WW2? 1:15:06 – How many machine guns came back with US GIs after WW2? 1:21:05 – Did the bump stock ban impact machine gun prices?